Expat did you ever sit down and thought, that if the vaccine is that dangerous, why researchers in the NIH and their families, are being vaccinated? One of the researchers in the NIH, is family friend. Me Godchild is also ah researcher not at NIH, but ah very prestigious university. Me Godchild would not lead me wrong, so ah drinking and eating anything he say. Guys, do folks who forgo umbrellas and get wet melt away? Or, is it that, assuming that non-umbrella users get soaked from the rain, some may get a cold while others simply dry off and keep going the next day with a pep in their step (no rain-soaked effects)? Or, is it that those who choose umbrellas have a permanent pep in their step, no let up, even on no-rain days? 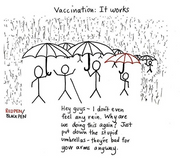 What rain/umbrella lesson is there for vaxxers and anti-vaxxers? A simple solution, really: to each his/her own! New York county declares measles emergency. Bans all unvaccinated minors from public places. I hope they banned the unvaccinated minors' anti-social parents too. No need for concern. Lots of vitamin C and plenty of chicken broth will take care of those measles. ? I trust that was humour? While vit C is in there, and yes Chicken Broth does actually help with many illnesses. I trust that is so the vaccinated with live virus culture do not infect the unvaccinated ones. The vaccinated ones obviously are 100% safe... or maybe not? Vaccination of public officials especially Doctors Nurses etc is COMPULSORY. Libertarians should be up in arms about it, but they seem to like the Nanny State. Maybe because it fits with their view? Otherwise they might be screaming Government over reach.